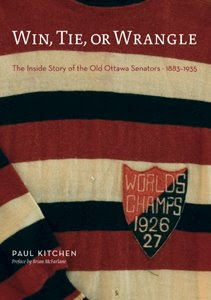 I just learned about this new title this weekend: Win, Tie, or Wrangle: The Inside Story of the Old Ottawa Senators. Published by Penumbra Press, the book is written by retired librarian Paul Kitchen. The Ottawa Citizen, who called the book "an impressively detailed history," recently interviewed Kitchen. I do not really know much about the book, so you'll have to rely on the two links above until further notice.